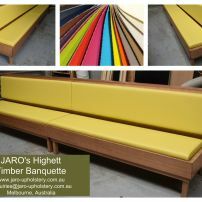 commented on "JARO's Timber Banquette Seat with Upholstered Seats & Backs Melbourne"
A very sturdy and great looking banquette. Available in an amazing range of vinyls or fabric options. Dark stains also available. 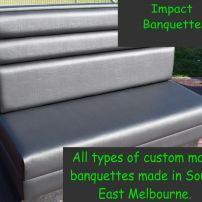 Made in Melbourne to your requirements. All quality materials used! commented on "Striped Banquette Seat"
commented on "Custom Made Banquette Sofas for Heavy Commercial Use"
commented on "Diamond Buttoned Banquette Seat"
Diamond Buttoned Banquette Seat available in white, black, brown, red and so many more colours. Contact Jason on 0402 188238 for your free quote. commented on "Diamond Buttoned Banquette with Cabriole Legs"
Looking for an elegant style of seating for your dining room. Look no further! 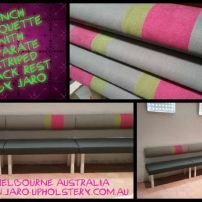 JARO can custom make all sorts of seating to suit your room. 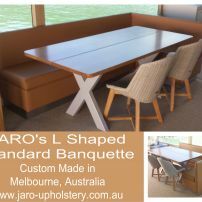 commented on "New covers for Banquette seats at LaTrobe University"
commented on "JARO's L Shaped Banquette Seat manufactured in Pakenham, Melbourne. 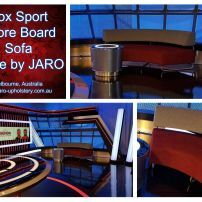 Other styles & colours available"
commented on "JARO's Oscar Bench Banquette seat is a very popular choice for the modern home or for commercial use"
JARO's Oscar is a very popular choice for the modern home or for commercial use. The Oscar is a versatile choice of seating. Click on picture for more. 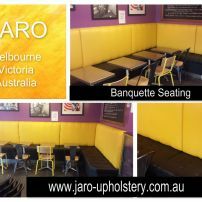 commented on "Rainbow Cafe & Restaurant Booth & Banquette Seating, Melbourne"
JARO can help you design that special look for your venue whether it is bright and colourful or more traditional. 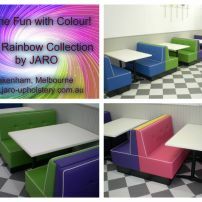 The Rainbow Banquette Seats are available in a large range of colours. We can also supply the matching tables. Click on picture for more ..